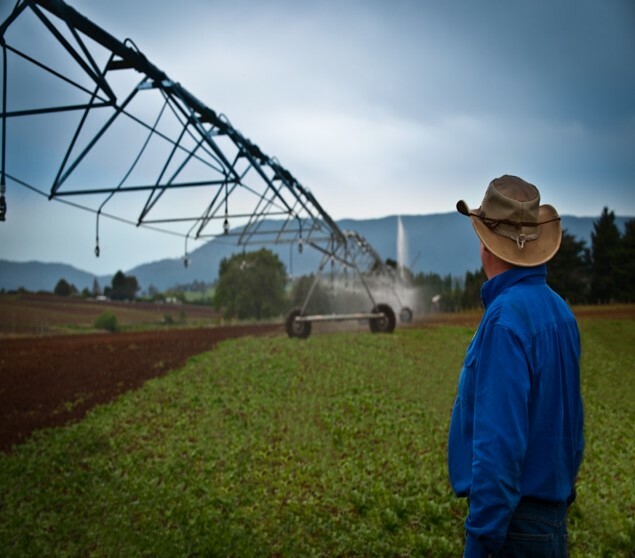 The CSIRO has been working with farmers in North East Tasmania to better manage shared water resources during low rainfalls periods and potentially avoid water restrictions. In the Ringarooma catchment, real-time sensor data were federated with new data services from the Bureau of Meteorology (BoM) to provide an online dashboard tailored for use by the Ringarooma Water Users Group (RWUG). These data services included observations and forecasts for rainfall, evapotranspiration and streamflow at several points in the catchment. Through the use of the dashboard using real-time water information, farmers have been able to demonstrate to the regulator their responsibility and increased sophistication in water management. With government cooperation, adaptive management resulted in fewer water restrictions being imposed. The economic benefits of adaptive water management included an increase in farm crop and pasture production. An economic impact assessment involving about a sixth of the farmers in the Ringarooma catchment determined that the total economic benefit of adaptive management to them was estimated to be $1.5 million in one extremely dry irrigation season. Social and environmental impacts include the maintenance of environmental flow levels designed to protect stream habitat, and improved social cohesion and resilience being built among the irrigation community. ICE WaRM is delivering a free webinar on this case study, presented by Dr Smethurst, Brigid Morrison and Mr Andrew Aldridge, Chair of the RWUG. “With constraints on human and financial resources, and the need to improve production and environmental outcomes in irrigation communities in data-rich situations, some governments and communities are increasingly looking towards adaptive co-management models. This webinar provides an example where such a model was developed with very positive outcomes.” says Dr Smethurst. The Sense-T Adaptive Water Resources Management project consisted of two stages. Stage 1 demonstrated how real-time data could be used for understanding and coordinating water management by water authorities and users at the catchment level. Stage 2 implemented and extended that demonstration to achieve triple-bottom-line impacts in the original focus catchment. Based at the University of Tasmania, the Sense-T was a partnership between the University, CSIRO and the Tasmanian Government, and was also funded by the Australian Government. The dashboard provided was decommissioned at the end of the project and replaced to some extent by an upgraded state government data service.